Metropolitan Serapion is the first hierarch and bishop of the Coptic Orthodox Diocese of Los Angeles, Southern California, and Hawaii. He was ordained as a priest on July 18th, 1981 at El-Sourian Monastery. H.H. Pope Shenouda III then sent him to serve the Coptic community in Switzerland December 1983 to June 1985. On June 2, 1985, he was ordained as a bishop for the Bishopric of Public, Ecumenical, and Social Services at St. Mark Cathedral in Cairo. Ten years later, on November 14th, 1995, His Eminence was called to be the Bishop of the Diocese of Los Angeles and Southern California, and was later enthroned as the Bishop of the Diocese of Los Angeles on December 23, 1995 at Holy Virgin Mary Church in Los Angeles. He is on the Governing Board of the National Council of Churches of Christ and the Steering Committee of Christian Churches Together in the USA. For many years he served on the Central Committee of the World Council of Churches and the Life and Service Committee of the Middle East Council of Churches, and as Vice President of the All Africa Conference of Churches. 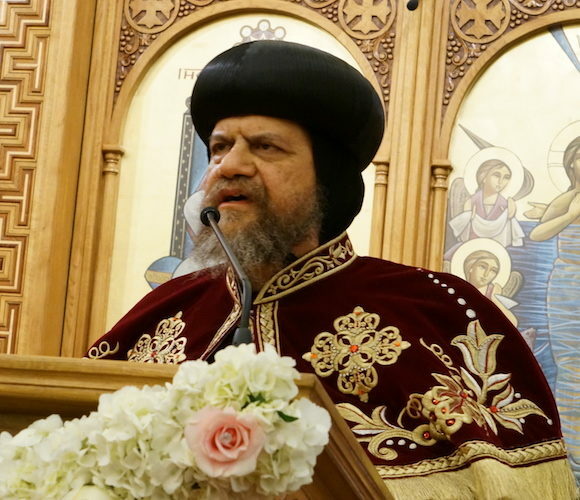 On Sunday, February 28, 2016, His Holiness Pope Tawadros II elevated Bishop Serapion to the episcopal dignity of Metropolitan. His official title is Bishop of Los Angeles and Metropolitan of Southern California and Hawaii.